Imagine dropping anchor under the cliffs of Zakynthos, where a vast smuggler’s ship rusts into the sands or partying with the superyacht set under the windmills on glamorous Mykonos. On a Greek Islands yacht charter, you might explore the sunny olive groves of Homer’s Ithaca, or stroll Venetian palaces in UNESCO-listed Corfu. Drink champagne in Glyfada’s beach club, float through the blue sea caves of Paxos or wander through crumbling ruins in Delos, Athens, or Delphi. 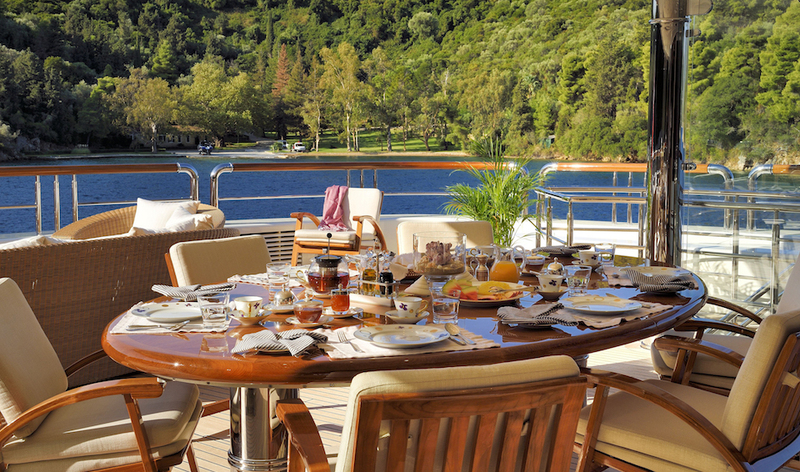 All of this – and more – is possible on a Greek Islands yacht charter. This example ten-day itinerary gives an exhilarating taste of what you’ll encounter as you float through the Ionian and Cyclades archipelagos from Corfu to Athens. Join your Greek Islands charter yacht in Corfu, where the UNESCO-listed Old Town dazzles with its Venetian palaces, medieval laneways, and elegant Parisian arcades. Pastel buildings line the waterfront, shady café tables sit on time-worn cobbles, and the mountains of Albania rise up in the distance. Corfu Old Town, guarded by its two immense hilltop fortresses, is a magnificent place for exploring, with highlights including Achilleon Palace, the Liston Arcade, and the Royal Palace. 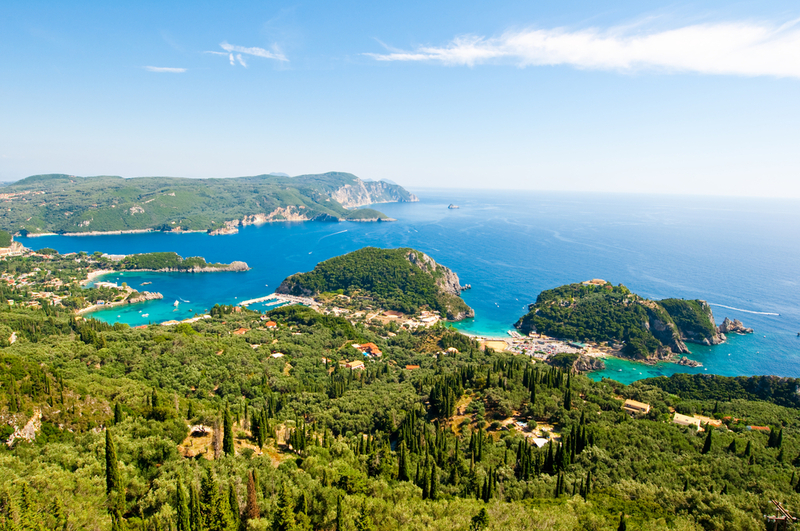 The yacht will then sail along Corfu’s spectacular coastline to Palaiokastritsa, a pretty village surrounded by olive groves, dramatic cliffs, and six dazzling blue-green bays. Drop anchor for an afternoon of watersports or cruise around the coastline to where the Byzantine castle of Angelokastro perches on a clifftop 300m above the sea. 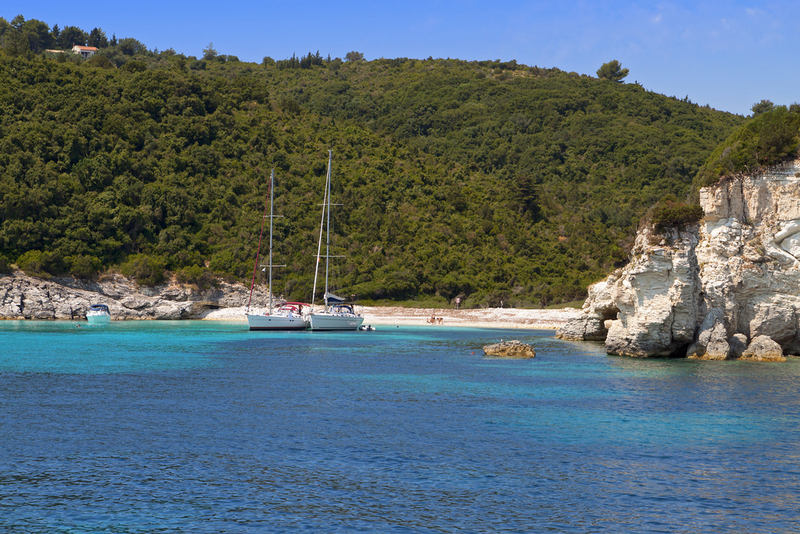 A day on Paxos and its tiny sister island, Antipaxos, is pure yachting bliss. Cruise to idyllic Antipaxos first, where the beaches of Vatoumi and Vrika are some of the finest in the Mediterranean, offering cliff-hemmed coves of soft white sand and blinding turquoise water. Enjoy lunch on deck or swim ashore to a beach tavern, before making the short trip across to Paxos to visit the glowing blue sea caves, which you can explore via kayak or tender. The charming port town of Gaios is sheltered by two islets, creating a beautiful river-like waterfront which is lined with colourful fishing boats and café awnings. A gorgeous place for a late afternoon stroll! 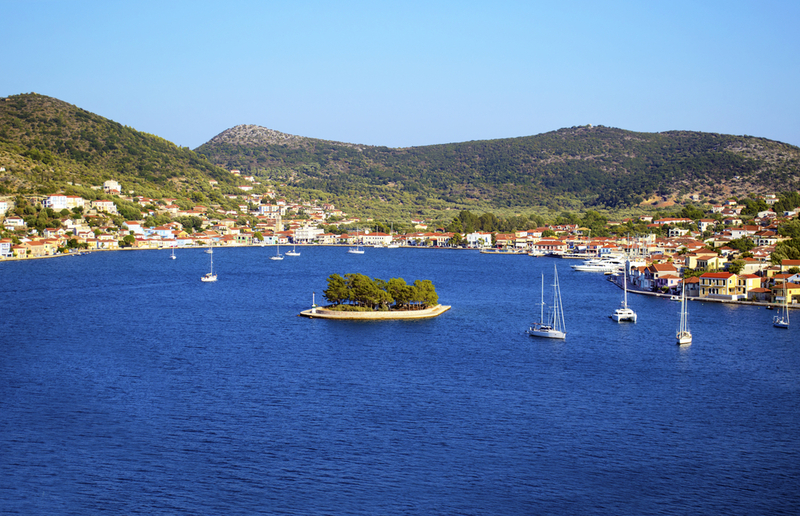 You can remain in Gaios overnight or move the yacht to the harbour town of Lakka. It’s said that the island of Ithaca was the birthplace of Homer’s Odysseus, and there is a sense of ancient myth that lies over this island, with its sunny olive groves and mountain hiking trails among the wildflowers. The Cave of the Nymph and the walk to Arethoussa Spring are two attractions for those chasing Homeric myth, while others just may prefer to laze about on Ithaca’s lovely beaches, including Agios Ioannis with its emerald and sapphire waters. When you’ve had your fill of sun and sea, head to the gorgeous capital of Vathy, where you can dine at one of the waterfront tavernas, or head up into the green hills to Stavros village, where Yefuri Restaurant is a standout. One of the most breathtaking sights on a Greek Islands yacht charter is to be found at Shipwreck Beach on Zakynthos, where a huge smuggler’s ship lies rusting into the sands under the shadow of vast limestone cliffs. The beauty of this place is only magnified by the colour of the water at the beach, which glows an almost iridescent blue. After you’ve swum and explored the beach, the famous Zakynthos Blue Caves are just a short cruise away, where you can snorkel or paddleboard through the glimmering caves and archways. You might also want to drop anchor off Marathonisi Island to swim with loggerhead turtles, and divers even may even spot the extremely rare Mediterranean monk seal. As you leave the Ionian Islands and head towards the spectacular Corinth Canal, you’ll stop along the way at Itea, a mountainous coastal region best known for the spectacular ruins of Delphi and the pretty port town of Galaxidi. Drive up into the hills to marvel at the Temple of Apollo at Delphi, an ancient pilgrimage site where people came to ask the Oracle of Delphi to share the secrets of the gods. 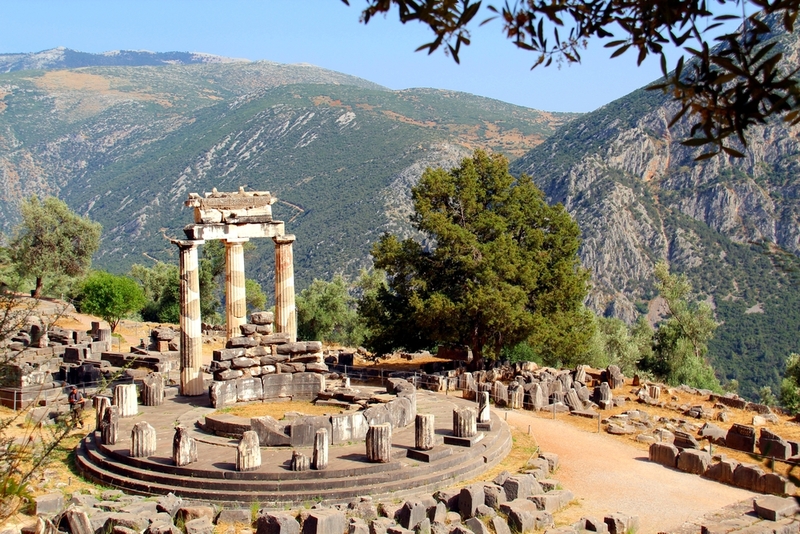 Delphi was considered the centre of the world in classical times and there’s a wealth of ruins to see, from an amphitheatre to the Temple of Athena, as well as a museum. Back down on the coast, Galixidi charms endlessly with its neoclassical mansions and bougainvillaea lanes, and the nearby coves are brilliant for watersports. After transiting the Corinth Canal you’ll arrive in Glyfada, a swanky waterfront district of Athens sometimes referred to as the ‘Hellenic Hamptons’. Glyfada and its neighbouring villages of Voula and Faliron make up the Athenian Riviera, where you can expect glamorous beach clubs, boutique shopping, and palm-lined waterfronts. Astir Beach Club on the Laimos Peninsula is the last word in style, with a superyacht clientele enjoying massages and long champagne lunches on all-white terraces by the sea. For a change from the beach head to Lake Vouliagmeni, where cliffs surround an emerald-green hot spring lake. Soak in the mineral-rich waters or laze about on the terrace deck, before heading for a game of golf at the splendid Glyfada Golf Club of Athens. 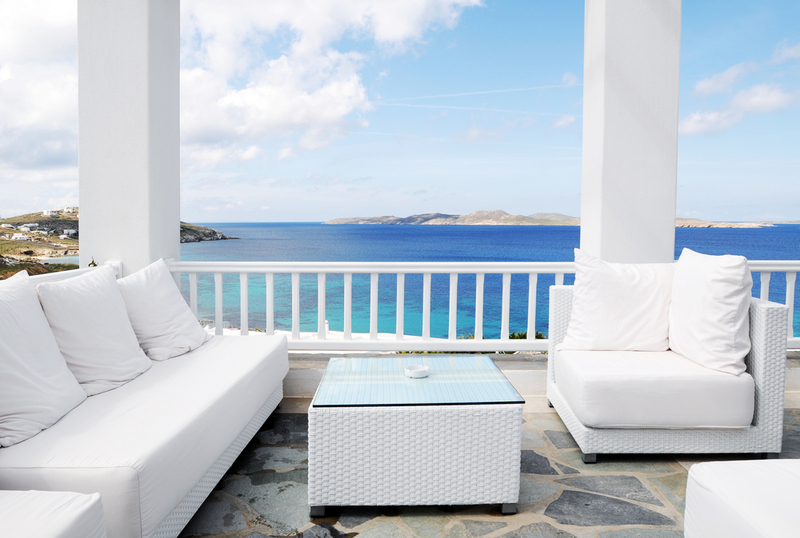 Today your Greek Islands yacht charter enters the spectacular Cyclades archipelago, where Kythnos is your first stop. This hilly, arid island is the perfect escape from the world, offering whitewashed villages, flowery laneways and pretty beaches shaded by tamarisk trees. 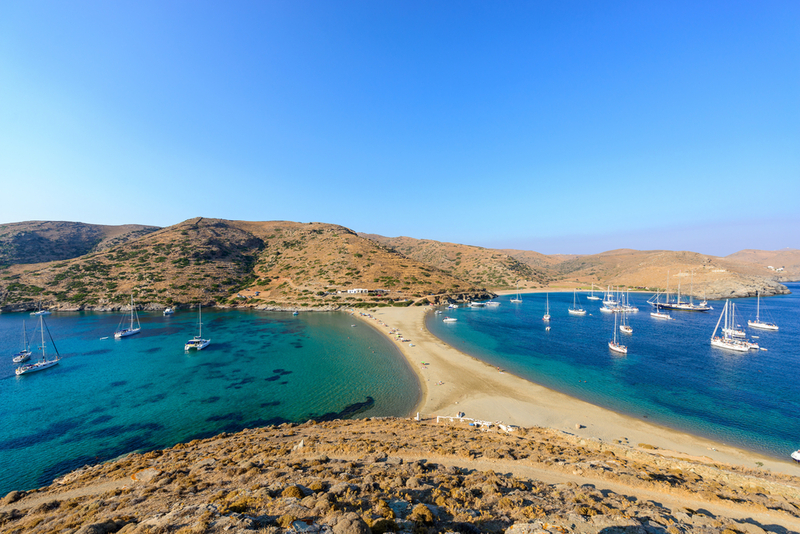 Your yacht will drop anchor at the stunning Kolona Beach, where a long strip of sand connects the island to the islet of Agios Loukas, creating ‘double beaches’ facing out onto two cobalt-blue bays. Other attractions on Kythnos include the thermal springs at Loutra and the picturesque villages of Chora and Driopida. If you’re looking to explore nearby islands, Kea, Sifnos and Serifos are also within very easy reach. Relaxed and recharged after your day on tranquil Kythnos, today you’ll arrive in glamorous Mykonos—one of the highlights of any Cyclades yacht charter. Pull into the superyacht port to see the iconic sugar-cube houses and thatched windmills on the hill, then spend an afternoon lazing about by the sapphire sea at Nammos Beach Club. 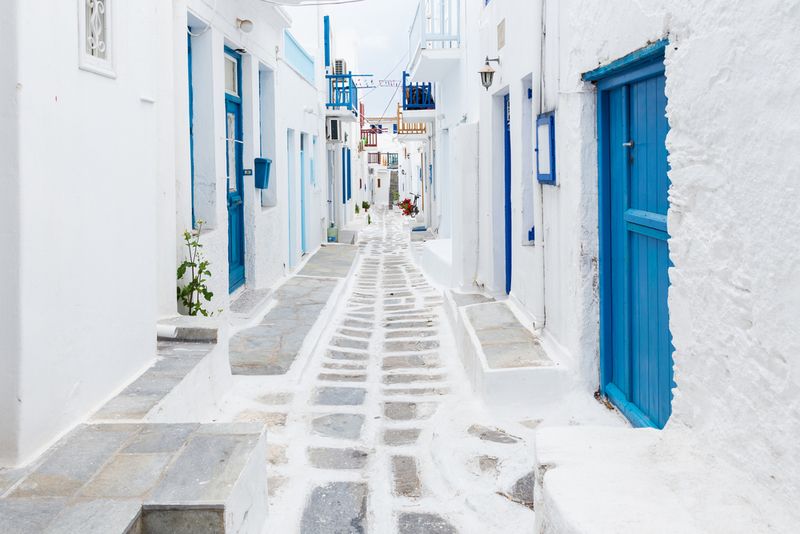 If you can drag yourself away, head to Mykonos town for an afternoon’s boutique shopping along whitewashed lanes, and then make your way to Little Venice to drink cocktails on the waterfront at sunset. The party vibe electrifies the night in Mykonos, where you’ll eat in fine restaurants such as Nobu or Ambrosia before heading to Cavo Paradiso to dance until dawn. After a morning stroll and a café frappe in Mykonos, the yacht will move to the sacred island of Delos, the mythical birthplace of the god Apollo and the goddess Artemis. Once the most important religious centre in the Classical world— so sacred that no person was ever allowed to be born or to die on the island—Delos today is a veritable open-air museum and archaeological site, with temples, amphitheatres and sculptures slowly crumbling into the dust under the Mediterranean sun. Wander along the Terrace of the Lions and marvel at the mosaics of ancient mansions before heading back to your yacht at anchor to cool off with a refreshing swim and a late lunch on deck. The final full day of your Greek islands yacht charter will be spent on Syros, a green and hilly island with a splendid waterfront capital and excellent beaches. Hermoupolis (the city of Hermes) was once the wealthiest port in all of Greece, and the architecture bears testament to the city’s glorious past, with fine Venetian mansions, Neoclassical facades, and narrow lanes running between whitewashed houses. Those wanting to see the city from above should walk the hill up to Ano Syros and visit St George Cathedral with its bright blue dome high above the sea. When you’ve explored the many treasures of Hermoupolis, make your way along the coast, where the seaside village of Della Grazia is a neoclassical beauty, with fine villas, fruit orchards, and lush gardens by the beach. The yacht will get away early to transit to Athens, a city so full of treasures that you may want to extend your trip to enjoy them all! 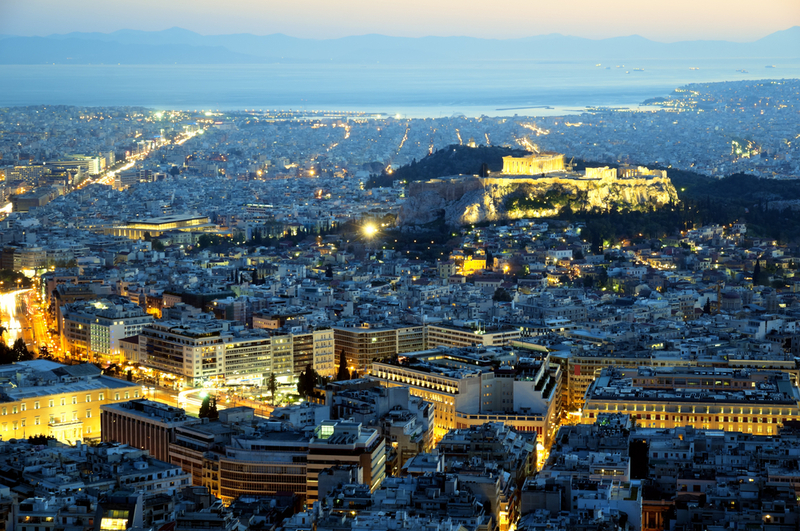 If you only have a morning in Athens before disembarking your yacht at noon, the obvious choice is to stroll up through the narrow lanes of Plaka to the ancient Acropolis, where the mighty Parthenon stands guard over the city of Athens. From up here, the ancient city is spread out before you in all its glory- the Theatre of Dionysus and Hadrian’s Arch, the Olympic Stadium and the Temple of Olympian Zeus. Below you, the red terracotta roofs of Plaka soon give way to the white sprawl of modern Athens, and in the distance, the Aegean Sea sparkles. What better place to end your Greek Islands yacht charter?